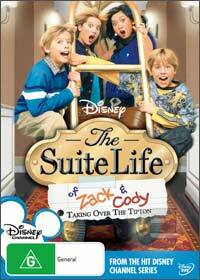 The Disney Chanel's The Suite Life of Zack and Cody arrives on DVD in Sweet Suite Victory which revolve around Zack and Cody Martin, identical twins who are also played by real life twins Dylan and Cole Sprouse who life in the luxurious Tipton Hotel in Boston with mother Carey Martin (Kim Rhodes). Basically, these twins get up to a variety of mischievous activities that younger viewers will find hilarious. There is even a Paris Hilton clone in the series who is actually quite funny and adds to the ambience of the series. Although targeting the younger audience, the series contains some adult content which younger children may not understand, however there are enough laughs for all involved to keep you glued to the screen. The premise behind this current installment revolve around London and Maddie who battle each other for the best Sweet 16 party, however Zack and Cody are along for the fun, like two little gremlins. It may not be the most original series to date, however for children, it's definitely one that they will thoroughly enjoy.